Georges decided to move away from pedals. The CM 125 Luxe is powered by a small 125 cc engine to conform to the sans permis class. 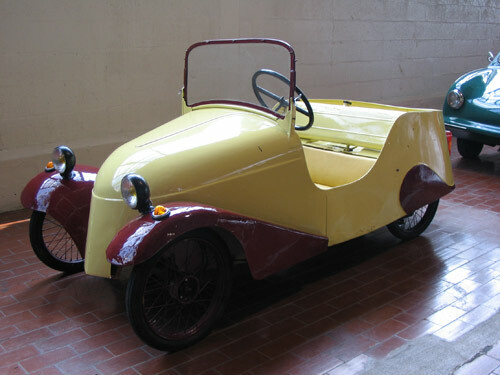 The car sold well partly because no driver’s license was required, and partly because new post-war French cars from Citroën and Renault had a waiting period of years, compared to Mochet’s six weeks. This example from the first year of production has the nose section flanged and bolted instead of welded. It has a primitive “homemade” steering wheel. The gas tank also serves as an extension of the seatback. At Mochet’s peak in the early 1950s, he was making 40 cars a month.